China is using its weapon of choice in the ongoing Currency Wars - Gold. The more price suppressed by the Western Central Banks - the better it is for China. Steady flow from the West to the East is the name of the game in the Gold markets these days. It is the military exercise with the state-level planning involved. According to Jim Rickards, China uses multiple covert channels to accumulate Gold during this phase of the Currency Wars. In other words, a full-blown scorched earth campaign by Russia." "TNR Gold has published its new Shotgun Gold presentation. After the news about Barrick Gold and Newmont Mining talks about the merger we are looking for the major bottom in the mining cycle. The best projects will find its way now to the investors' radar screens." "As you remember, we were looking for M&A activity in Gold and Commodities to pick up in order to confirm the major Bottom built up last year. Now we have the very important confirmation about that bottom from the industry insiders. Announced deals with Las Bambas - being bought by Chinese companies and these talks about the merger between Barrick Gold and Newmont Mining signify the very important point in the cycle. It is cheaper "to dig" for Gold and Copper on the Exchange than in the ground. Depressed market valuations of the resources represented by the discounted share prices of miners provide the best entry points in the decades for the commodity markets. It is not only our talk any more - it is the flash news from the top boardrooms in the mining business. It is the money talk by the Insiders. "Don't discount this merger talks in the future!" China has begun allowing gold imports through its capital Beijing, sources familiar with the matter said, in a move that would help keep purchases by the world's top bullion buyer discreet at a time when it might be boosting official reserves. The opening of a third import point after Shenzhen and Shanghai could also threaten Hong Kong's pole position in China's gold trade, as the mainland can get more of the metal it wants directly rather than through a route that discloses how much it is buying. China does not release any trade data on gold. The only way bullion markets can get a sense of Chinese purchases is from the monthly release of export data by Hong Kong, which last year supplied $53 billion worth of gold to the mainland. "We have already started shipping material in directly to Beijing," said an industry source, who did not want to be named because he was not authorised to speak to the media. The quantities brought in so far are small, as imports via Beijing have only been allowed since the first quarter of this year, sources said. The People's Bank of China (PBOC) is believed to be adding to its gold reserves, according to the World Gold Council (WGC), as it looks to diversify from U.S. Treasuries. The central bank rarely reveals the numbers. Gold's 28 percent plunge last year and China's record bullion imports in 2013 sparked speculation that the PBOC has added significant amounts of gold to its reserves, and could likely make an announcement this year. Central banks tend to be very secretive about their gold purchases and sales because prices are extremely sensitive to their trades. Rumours last year of Cyprus selling its gold reserves to prop up finances sent the metal down more than 10 percent over two days - its biggest such decline in 30 years. Gold has traditionally been imported from Hong Kong into Shenzhen, where nearly 70 percent of the Chinese gold jewellery business is located. Shanghai was opened up as a second port last year. Only banks are allowed to import gold into China. Industrial and Commercial Bank of China Ltd, Agricultural Bank of China Ltd, ANZ and HSBC are among the 12 banks that can import gold. China imported nearly 1,160 tonnes of gold from Hong Kong last year, more than twice that of 2012 as the drop in prices caused a spurt in demand. An analysis of trade figures from data provider Global Trade Information Services showed that China imported at least another 194 tonnes last year from centres other than Hong Kong, likely into Shanghai, showing that direct imports have ramped up. One of the reasons why China could be encouraging more direct imports was because it wanted to avoid taking the Hong Kong-to-Shenzhen route that makes its gold purchases public, while China wants to keep the trade a secret, sources said. "There is a view that why should people know how much China is buying," said one of the sources at a bullion banking operation in China. "With the Hong Kong route, there is a lot of transparency and people can easily monitor what is going in and out." Another source said the move to open up Beijing "is partly driven by the fact that Hong Kong is perhaps a little too transparent", but it is also to accommodate upcoming free-trade zones and non-jewellery demand. The Shanghai Gold Exchange, the platform for all physical trades in China and in whose vaults importing banks store gold across the country, was not immediately available to comment. 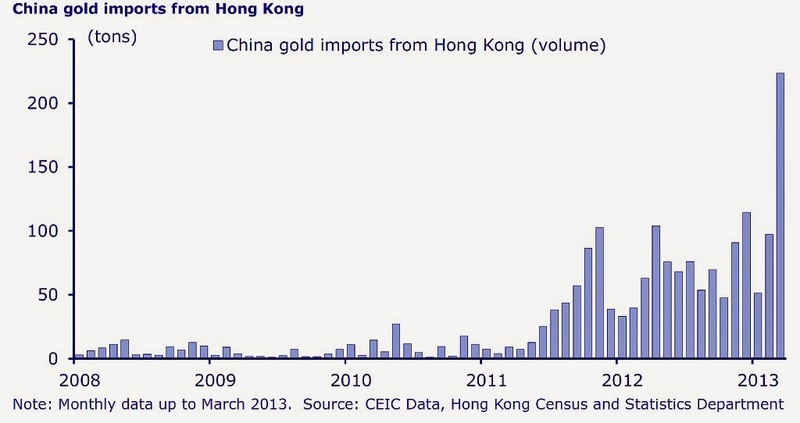 Besides the 1,160 tonnes of gold imported from Hong Kong last year, China had about 428 tonnes of local production. The WGC has said Chinese demand in 2013 was 1,066 tonnes, leaving industry guessing about the "surplus" of around 522 tonnes, not including the amount of direct imports. The central bank last disclosed its gold reserves in 2009, when it announced that its bullion holdings had risen to 1,054 tonnes from 600 tonnes in 2003. Philip Klapwijk, managing director of Hong Kong-based consultancy Precious Metals Insights, has said China's official-sector purchases could have totaled 300 tonnes in the first half of 2013, and the pace likely continued in the latter half. "The major increase in gold supply to the Chinese market in 2012 and especially 2013 could be partly related to large-scale official purchases," according to a Klapwijk-led survey for the WGC that was released last week. The report said while a part of the surplus was being used for commodity financing deals, some of it could be for the PBOC as well. Rumours on PBOC's gold reserves range from 3,000 tonnes to 5,000 tonnes. The United States is the biggest holder of gold reserves with over 8,000 tonnes. Even a 1,000 tonne increase from last announced levels could prompt a jump in gold prices, which would make the PBOC very cautious about the timing of any announcement, said two China gold market analysts, who didn't want to be named due to the sensitivity of the issue. (Editing by Muralikumar Anantharaman)"